In case you missed it, last Tuesday the Senate HELP Committee held a hearing entitled "Access to Care: Health Centers and Providers in Underserved Communities". Four health center witnesses spoke to the importance of extending and stabilizing funding for health centers, the National Health Service Corps, and the Teaching Health Centers program. Their testimony underscored the value of federal grant funding, as well as workforce programs that are vital to health centers across the country. We also wanted to share that in addition to the two bills already introduced in the Senate ( S. 106 and S. 192), we are expecting a third bill to be introduced next week by Senator Bernie Sanders (I- VT). While the details are still being ironed out, we expect this bill to include a five-year extension with increases in funding for Community Health Centers and other key programs. As we've said over the past few weeks, all of this action and showing of support so early in the new Congress is truly a testament to the extraordinary work of health center advocates over the past several years. GET READY- next week, we'll be sending a Call to Action to ask you to reach out to your Senators and urge their co-sponsorship of at least one of these bills. We will provide background information and a pre-written email; all you have to do is click send! Click here to access the hearing recording, as well as a copy of the witness testimony. Click here to read an op-ed by Sen. Lamar Alexander entitled "Community health centers vital to Tennessee"
We have more good news to share! In addition to the CHIME Act introduced in the Senate earlier this month (read below for the original blog post with more information), last week Senate HELP Committee Chairman Lamar Alexander (R-TN) and Ranking Member Patty Murray (D-WA) introduced legislation to extend health center funding, as well as several other health-related programs, for an additional five years. What does the Senate HELP bill ( S. 192) mean for health center funding? As you may know, the Senate HELP Committee has jurisdiction over the health center program in the Senate, meaning that they will play a key role in determining what will happen with our mandatory funding this year. This legislation is a strong showing of support for the need to extend health center funding well before its expiration on September 30, 2019, and we're grateful to Senators Alexander and Murray for their support. Next Tuesday, January 29th at 10:00AM ET, the Senate HELP Committee is holding a hearing entitled "Access to Care: Health Centers and Providers in Underserved Communities". The hearing will include four health center witnesses who will speak to the importance of extended funding for health centers, the National Health Service Corps, and the Teaching Health Center program. Given all of these exciting developments, we're putting the final touches on materials that will allow you to most effectively connect with your Members of Congress and rally your networks to do the same. All of this action and showing of support so early in the new Congress is truly a testament to the extraordinary work of health center advocates over the past several years. THANK YOU for all your hard work, and get ready to take action. We'll be in touch very soon with next steps! Read Senator Alexander's press release upon introduction of the bill. For more information on the Senate HELP hearing, including viewing the list of witnesses, watching live on 1/29 at 10:00AM ET, or accessing a recording, click here. Confidentiality and Medical Records: Do Special Protections Apply? Since the 1970s, the Federal Government has required that the medical records of patients who receive treatment for substance use disorder (SUD) be given extra protections to ensure confidentiality. These federal rules - commonly known as 42 CFR Part 2 - have recently been revised, and are more extensive than the standard protections required under HIPAA. Given the Health Resources and Services Administration's (HRSA) recent announcement of the availability of funds to expand access to substance use disorder (SUD) and mental health services, health centers are reportedly concerned about complying with the revised confidentiality rules that impact medical records for SUD treatment. First, health centers should note that the 42 CFR Part 2 rules do not apply to all SUD records; rather, whether they apply depends on the characteristics of the health care provider who provided the SUD services. In general terms, only records generated by providers who are publicly identified as offering SUD treatment services are subject to 42 CFR Part 2. According to the final rule issued in January 2017, health center providers generally are not subject to these requirements, as they are viewed as providing "general medical care." They "work in an identified unit within [the health center] that holds itself out as providing, and provides, substance use disorder diagnosis, treatment or referral for treatment"
"the primary function of the provider is substance use disorder diagnosis, treatment or referral for treatment and they are identified as providers of such services." In other words, if a health center provider is publicly identifiable as a provider of SUD services, either by the unit they work in or individually, then the medical records they generate are subject to the 42 CFR protections. This means these providers are required to obtain patient consent before sharing information about SUD diagnosis and treatment. Click here for more information on which health center providers are subject to 42 CFR Part 2. The 42 CFR requirements can complicate efforts to coordinate care for patients who are dealing with SUD. To help address those problems, the recent revisions made some simplifications to the consent process; for example, patients can now consent to sharing with their records with all providers within a specified group, as opposed to having to name each provider individually. In addition, some states and providers are adopting innovative approaches to support ensuring care coordination while maintaining appropriate confidentiality. For example, see this case study of how a community has implemented a standard consent form. More information on coordinating care for patients with SUD while adhering to 42 CFR protections is available from the HRSA/ SAMSHA Center for Integrated Health Solutions. This project was supported by the Health Resources and Services Administration (HRSA) of the U.S. Department of Health and Human Services (HHS) under cooperative agreement number U30CS16089, Technical Assistance to Community and Migrant Health Centers and Homeless for $6,375,000.00. This information or content and conclusions are those of the author and should not be construed as the official position or policy of, nor should any endorsements be inferred by HRSA, HHS or the U.S. Government. We've always known that health centers and Medicaid are ideal partners in the effort to cut health care costs. A host of independent studies, both statewide and national, have confirmed those findings over the course of many years. Now a new NACHC fact sheet based on 2016 federal data showcases those findings and takes a closer look at the costs of caring for a large Medicaid population. 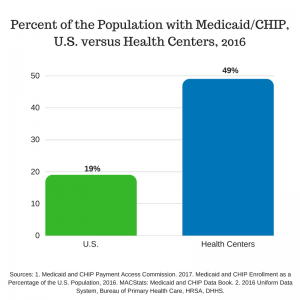 Health centers provide care to one in every 6 Medicaid beneficiaries, but Medicaid payments to health centers make up only just under two percent of total Medicaid spending. Meanwhile, health centers are providing affordable access to preventive care for a large portion of the Medicaid population, reducing costly visits to hospital emergency rooms. In fact, health centers save the Medicaid program $6 billion annually. And a previous landmark study [ see press release] found that in 13 states, health centers save, on average, $2,371 (or 24 percent) per Medicaid patient when compared to other providers. In communities fortunate enough to have a health center, there are lower rates of hospital utilization among Medicaid beneficiaries who are health center patients because having a usual source of care ensures they don't delay getting care until they are very sick. Caring for Medicaid patients does have its challenges, though. 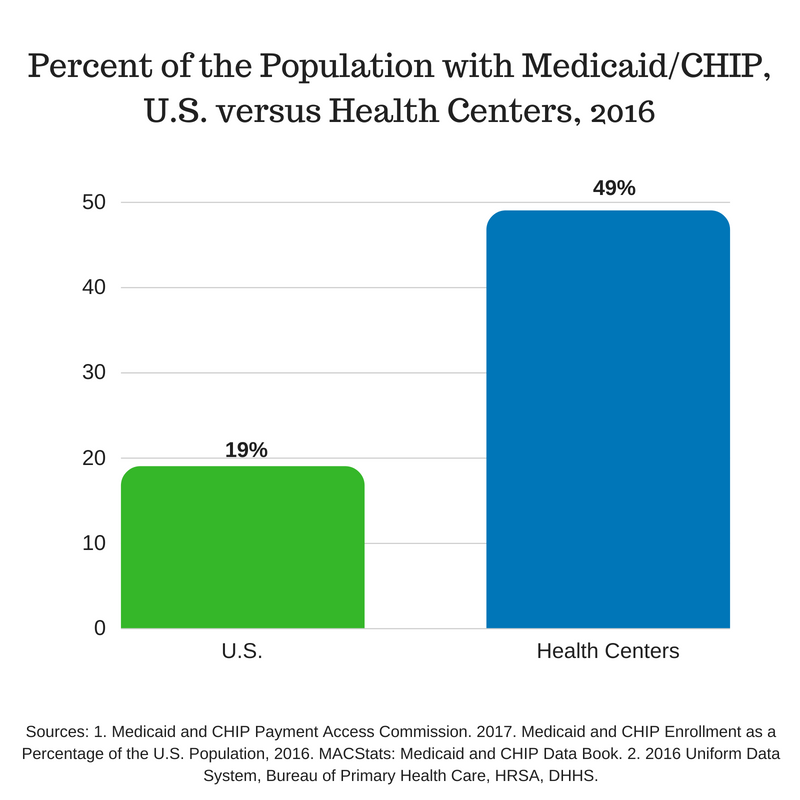 Nearly half of health center patients (49 percent) rely on Medicaid, but the amount of Medicaid revenue collected in 2016 only covered 80 percent of the cost associated with caring for that population, which puts health centers in a tight financial squeeze. Adequate Medicaid reimbursement is a key issue for health centers, as is a strong and robust Medicaid program.